Many things make up a modern society: its history, culture, natural setting, wealth, classes, and peoples. For some, the power structure, the political system, lies at the heart of the social order. Russia has long been a "political society" and its future may also be decided in large part by the power structure. A good way to understand Russia and other modern societies is to examine the ties between the "Soviet system" and the rest of the country's life. George Fischer argues that it is these ties that explain much about the consequences of a communist state. 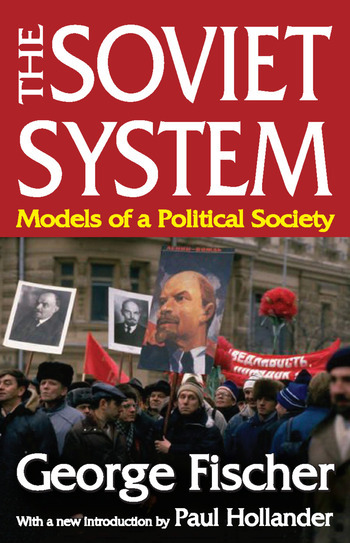 The Soviet System, originally published in 1968, presents a provocative challenge to prevailing theories of modernization throughout the world. In this book Fischer takes issue with current assumptions that societies developing an advanced, fully modern economy and culture must inevitably adopt Western-type social and political institutions. The author holds that our understanding of contemporary nations is impeded by assessing them in terms of the prevailing American theory of "pluralism." The notion that a "pluralist" division of labor pervades all of modern society is challenged and tested in the context of the former Soviet Union as a modern society. The emergence of the dual executive, a leader with a special mixture of political and economic know-how, is emphasized as a trend toward a "monist" model of society. Fischer demonstrates how this model, in which all power is public and both industry and culture remain part of a non-capitalist, non-liberal state structure, can prove useful in studying social change today. The result is a book of value to all scholars and students dealing with the social and political systems of both developing and advanced societies—long after the Soviet system of rule dissolved.